The 2017 Subaru Outback crossover SUV gets a new upper-tier model, the Outback Touring, which basically comes with all the options boxes pre-checked while adding nicer leather and unique styling cues. 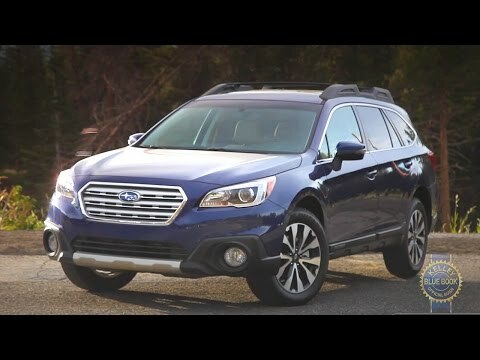 The rest of the Outback range remains largely the same, good news for this popular Subaru crossover SUV -- or if you prefer, popular high-riding wagon. I recently bought a new Subaru Outback. I love having the 4 wheel drive option as I am an avid outdoors person. I also have 2 dogs who love the vehicle and the extra space that they can lay down in the back. I haven't had the car for too long so I cannot speak to reliability; but it does come with a great warranty and option to purchase additional warranty. The Subaru’s aren't known as best in class for features; however I do feel like they offer the things that mattered most to me. I bought a more baseline model but it still came with my favorite features: connectivity for Bluetooth/android auto/apple carplay and heated seats. The car is very comfortable to ride in and has little road noise, great suspension even on tougher trails, and great amounts of space. My husband and I even took it camping and due to rain ended up sleeping fairly comfortably in the back. Good gas mileage and many optional safety features if you're willing to pay extra for them. Like: safety features like lane change warning, vehicle ahead stop/start warning, warning for approaching an object too closely, Eyesight features, headlight turns with steering wheel, separate battery for engine and separate for internal electrics, roomy driver/passenger area, driver power seat, global direction on rear view mirror, garage door open feature, excellent mileage without having to scale down to a smaller vehicle, split rear seat, power windows, spoiler, tinted windows, external weather temperature gauge, rear view camera. Dislike: A bit too long -- barely fits into garage. Has good mileage but the accelerator response is not good and car actually rolls back a little on an incline before the accelerator kicks in. This dislike has been mentioned on independent car reviews so I've accepted this little foible about the slow acceleration response. We are Subaru fans for life! I absolutely love my Subaru Outback. I love that Subaru vehicles come standard with roof racks and all wheel drive. These features are perfect for our outdoorsy family. We added on an optional package that include a moonroof and automatic lift gate for the backdoor which I love. I love my heated seats as well! The best thing is that I feel very safe driving it. I feel like it had everything that we wanted in a vehicle for a very good price. If I had something negative to say about it, it'd be that the all wheel drive means that you have to replace all four tires if one of them pops. This is standard for all wheel drive vehicles but it means you should definitely be aware of that cost and have money saved up for tire problems. Other than that it's our perfect vehicle!